A cleaner who was said to have been picking out card boxes from the rubbish bin has spotted a baby which was dumped in a dustbin by the young mother. A 15-year-old mother was caught on CCTV throwing away her newborn baby in a dustbin. 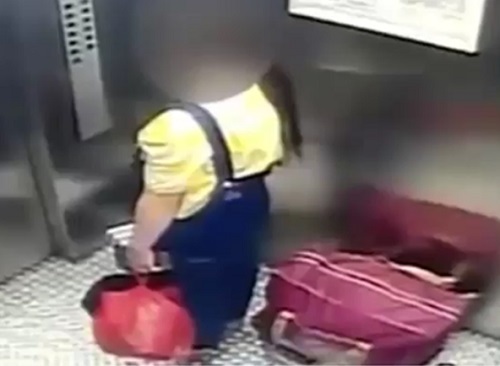 The young mother from China’s Shenzhen, was captured getting into a lift with the tiny box and some other bags on Saturday. According to Southern Metropolis Daily, a cleaner who was said to have been picking out card boxes from the rubbish bin spotted the baby. She was found smeared in blood but was still breathing. She was taken to Bao’an People’s Hospital and was found to weigh a 5.84 lbs and and had a low body temperature. The police confirmed that the baby belongs to the teenager after they arrived at her apartment and found blood in her toilet and unpleasant smell. The mother, who is said to live alone and work at a beauty salon, reportedly went straight to work after giving birth. 0 Response to "Shocking! Teenage Mother Caught Throwing Out Newborn Baby in a Dustbin (Video)"